So, it’s the start of a brand-new year and with that comes brand-new goals and aspirations. You figured what better time to start running to stay or get into shape. You’re well aware that you probably won’t ever dawn that gold medal at the Olympics for being the world’s greatest runner or anything, but you’d still like to become better at it nonetheless. Problem is when it comes to running, that sometimes the overwhelming feeling of stop running mid-run overtakes you and you stop. It’s okay. Don’t get down on yourself. We’ve went out and done all the research needed in order to find the best ways to help you improve your running skills. This article is full of all of the best advice we could find on running from simple tips such as wearing the proper running attire to more complex ones like controlling your breathing in order to run longer distances. We’re sure that by the end of it, you’ll have all the knowledge you need to take your running game to the next level and make your younger self proud! …Or at least run a full lap without dying. : –). With that being said…let’s begin. We know the term “interval training” may conjure up thoughts of some type of super scientific, extreme athlete, ironman-like workouts, but it’s not that. In the simplest of terms, interval training is nothing more than alternating between 2 or more exercises that require different degrees of speed, effort, etc. It’s not so bad. Also, according the to super smart dudes at NerdFitness, it also kick starts your metabolism. Now, in the case of running and interval training, you’ll alternate between walking and running. Typically, beginners should start off walking for around 30 seconds up to a minute long. This can vary based off of your current level of fitness and can be scaled up or down in relation to it. If you feel as though you are a bit more fit, walk for less time. However, in the event that you are in the greatest of shape, walk for a bit longer. Active Fitness has a really great article that shares a few training plans that include specifics to interval training. One of the best ways to perform this type of training is with the use of a timer or stopwatch. Set it for your designated walk time. As you walk, listen out for the beeping of the timer. When it goes off, immediately start to jog for the same amount of walking time. Again, use the timer to know when you should transition back to walking again. You will repeat this pattern of walking for 30 seconds and jogging for 30 seconds for about a total of 10 minutes. Your taking baby steps to improve your stamina. Keep in mind that this varies by your level of fitness. If you’re a bit more fit, instead of walking for 30 seconds and jogging for 30 seconds, try walking for only 15 seconds and jogging for may be 45 seconds. You can choose what works for you as long as you make sure to utilize the full 60 seconds when alternating between the 2 exercises. What you’ll soon discover after successfully performing these exercises, is that your aerobic endurance will rise. The 10 minutes of interval training that once drained every ounce of energy out of you in the early stages will eventually start to seem like child’s play. This is when you should start to scale it up. We have two FREE training plans (Intermediate & Advanced) that include week-by-week interval progressions that are designed to build your running base so that you are more consistent with your running times and work towards smashing a pr. How Will This Help You Keep Going? This will help you continue running when your body is screaming to stop due to the fact that you’ll be aware that all you have to do is make it just a “few more seconds” before life gets easier. TIME Magazine also wrote an article supporting the case behind a simple one-minute interval workout. US National Library of Medicine does a great job breaking down the mental side of knowing that you have "just a few more seconds" to get to while doing interval training. This does wonders to your self-confidence. Knowing you’re almost at the end allows you to push on a bit further through the pain when all your mind wants you to do is quit. Okay, so you know that interval training will help you out a bit when it comes to reaching your running goals, the one thing you might not consider incorporating as well is a little bit of “mental foolery”. By this we mean trick your brain to achieve longer goals by accomplishing smaller ones first. You’re jogging along nicely and all of a sudden you start to hear that little voice go off in your head whispering it might be about that time to stop. You ignore it and keep going. About a minute later, it’s back. This time a bit louder. Again, you ignore it and keep going. Noticing that you’re just not acknowledging the request to stop, Mr. Brain decides to get as loud as possible and draw all of your attention to your whole body! All of a sudden, you notice how hard you’re breathing, all of the sweat on your shirt that’s causing it to stick to your back making you uncomfortable, and that soreness in your thighs and calves that seem to be getting greater and greater with every extra step. Focus on an object that’s not too far away and tell your brain you’ll stop when you make it there. Now this one is pretty basic and doesn’t really require much. All you do is wait until that little voice kicks in and let the games begin. This is one technique that’s best to start as soon as you begin to hear “the voice” and start to feel fatigued. Instantly find an object a bit further along your path and focus on it. Make it your destination in your mind. Convince your brain that all you have to do is just make it to that destination. I tend to do this as I am starting to get closer to my house on my neighborhood runs. I will say something like, "I will make it my car, I can make it to my car, head up, shoulders down, you got this". This will enable you to keep going. Trick is once you get there, or at least very close, immediately switch your attention to another object a bit further along. Do not stop at the previous destination. Just keep going right on passed it. Continue to do that as long as you can. Before you know it, you’ll be exactly where you wanted to be, at the finish line. Another way to perform this technique is to simply imagine a rope tied around someone in front of you. Imagine pulling yourself closer and closer to them as you’re running. When you get next to them and finally pass them, do the same thing to someone/something else in front of you. Not only does doing it this way keep you focused on what you’re doing, but it also makes it a little fun. Why Does It Work & How Will It Help You Keep Going? Similar to the previous technique mentioned, this is another mind trick. This one however, not only gives you a destination/end goal to keep pushing towards, but it also gives you the mental fire power to shoot back at Mr. Brain when it starts screaming to stop according to the Huffington Post. You see, the reason it’s suggested to implement this technique at the first arrival of “the voice” is because you’ll be racking goals a lot earlier on. This will boost your confidence in yourself that even though your brain is screaming you’re done, your body can keep going. Similar to the interval training, each time you do this you build more and more confidence in yourself and your running abilities. On race day, you will be so proud of yourself when you push beyond what you have done before because of how mentally tough you are. There’s a very little known trick used by many long-distance runners to continue running when they get that urge to stop. Utilizing it should help you manage to keep moving forward when all you really want to do is collapse from exhaustion. Before diving way too deep into details, first less lightly mention posture. The Guardian breaks it down how your posture can effect your breathing while running. You might not understand how posture and breathing relate, but trust us, they do. Improper posture will hinder your breathing. We hate to be the ones to state the obvious, but it’s pretty much impossible for you to run hard and long if you can’t breathe. 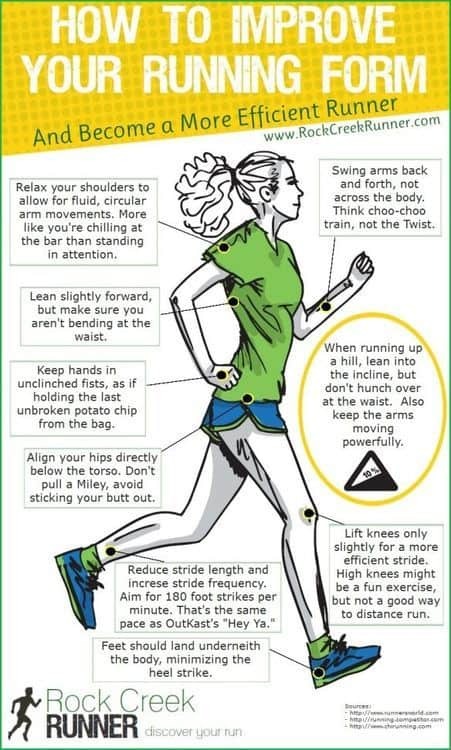 This awesome infographic below breaks down the proper running for to help you become a more efficient runner. Majority of people tend to have their shoulders hunched over. This makes it very hard for air to properly flow in and out of your lungs. If you’ve ever seen long distance runners, they always run with their head held high and shoulders pull back. We used to think it was just coincidence but later found that it is actually a consciously made body posture. It’s been discovered that keeping your shoulders held back allows you to properly inhale and exhale air out of your lungs. With no restrictions on your breathing, running becomes a lot easier. With your body able to get proper oxygen, how to breathe becomes the next thing to focus on. If you were to place your hand on your chest and another hand on your stomach while taking a deep breath, you can easily ascertain if you’re breathing correctly or incorrectly. If you notice that while inhaling deeply your chest inflates, the more than likely your breathing to shallow. This means you aren’t allowing enough oxygen to get into your body. 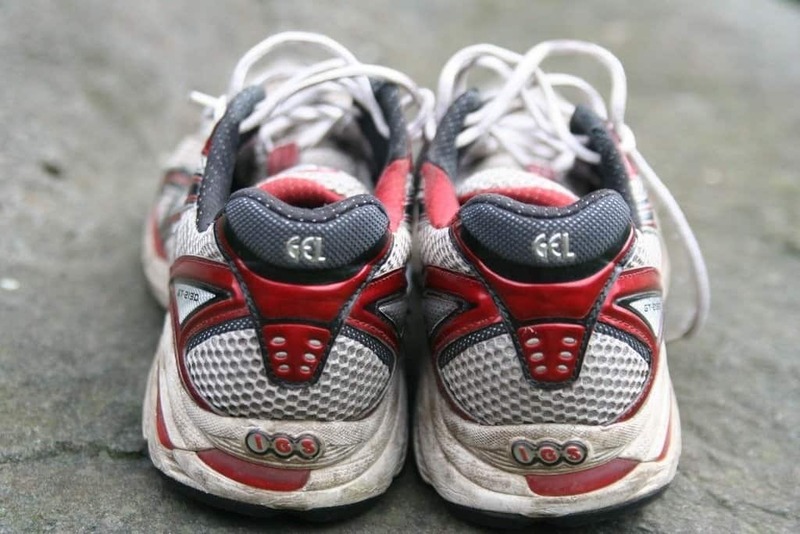 You want to get into the habit of breathing deeply and from your diaphragm while running. People breathe in a variety of ways. You’ve seen some people who breathe in through their mouth and out through their mouth, in through their mouth out through their nose, in through their nose and out through their nose, etc. all of which are wrong. The worst way to breathe is in through your mouth and out through your mouth. If you notice, as you do so, especially while running, your mouth tends to get very dry. This triggers a sense of the dehydration in your brain. 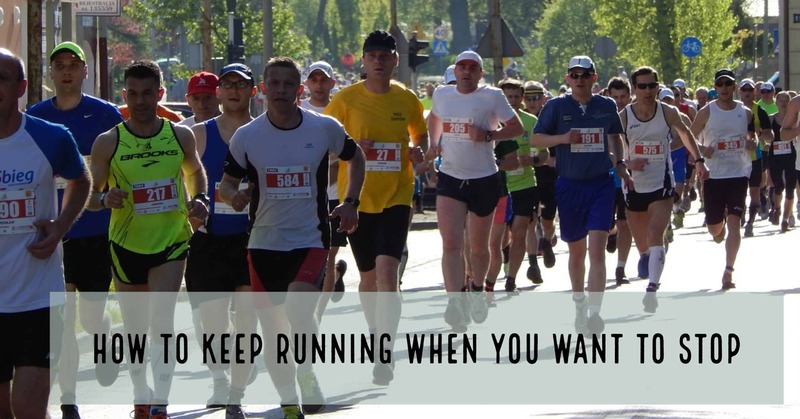 That is the absolute last thing you want your body to think while running. Breathing in through your nose and out of your mouth allows for not only proper oxygen flow to your body, but also makes it so that your mouth does not get dry as you exhale air. This simple trick will allow you to push on longer and further. To take the technique a bit further, it suggested that you keep track of how long you inhale and exhale during each breath. We share 4 simple breathing tips that make you a better runner. While running, you should follow the “4 in – 4 out” count. Basically, what this means is that as you’re jogging along, you want to inhale deeply through your nose for 4 seconds allowing your diaphragm to expand and then exhale for 4 seconds out through your mouth. As you keep your mind on your breathing, you’ll find that you haven’t noticed how tired you actually are. Before you know it, you will have been jogging for way longer then you had initially thought you could. Just as with the other tips that we mentioned, there is numerous information around on the art of breathing. Since we want you to focus all of your mental energy on these tips, once again, we went and found you a good reference video for more breathing techniques. This is a very short one created by Jeffrey Brooks that get straight to the point in the least amount of time. Now you might be wondering how this will possibly help you run longer when you’re tired and exhausted, so we’ll explain. You see, pain is mental (for the most part anyway). By focusing on your breathing, you take the attention away from the pain and the desire to quit. As the pain kicks in and your mind starts screaming for you to stop, move your thought process to maintaining the proper breathing technique. What will happen is as you start to count the seconds of each inhale and exhale, your feet will continue to move. Before you know it, you’ll look up and realize that you’ve arrived at your destination. You wanted to quit a half a mile back, but there you are standing at the finish line. Just because it’s a simple one though doesn’t mean that it should be overlooked. Following this one is sure to help you on your journey to becoming a great runner. Bet you never considered keeping track of your training sessions could actually help you push on when exhausted. Now what’s the point of working out and training for 6 weeks if you can’t remember where started at? Writing down your workout results or tracking them with a fitness tracker is one of the best ways to track how far you’ve come. There’s probably nothing more motivating than looking back to day 1, seeing that you struggled running for half of a mile, and then comparing it to the you of today who can easily run 2 to 3 miles just for fun. The great thing about this tip is that it doesn’t require a bunch of out-of-pocket expenses or a lot of time to implement. We’ve seen people jot down their results on something as simple as a napkin. Of course, we’d recommend maybe keeping it in your phone or somewhere where you can sync it online. If technology isn’t your thing though, a simple notebook always works. Garmin watches tend to be the best at tracking and uploading online. If you want to actually record them in a very organized manner a Running Planner is a tremendous way to do so. How did you feel while running and at what point? How long did it take you to complete your session? How did you feel at the end of the session (mentally & physically)? Did you complete the entire training session? Just like all of the previous tips, this one is all about the mental state during your running. If you’ve been keeping track of all of your work outs in detail as mentioned in the “Technique” section, then you’ll go into each new workout prepared. You will know everything to expect. Being aware of that will allow you to properly plan for it. Also, seeing how far you’ve managed to run on paper gives you the mental desire to surpass your previous best or tie it in the worst-case scenario. No one wants to look in the training journal and see they’ve been going backwards. You’ve been keeping track of your running progress for that past 3 training sessions. You’ve noticed that around a certain time period during your running that you start to hear that little “Time to Stop” voice. You’ve also noticed that in spite of that, you’ve still been making it to your destination in shorter amounts of time. You’re in the middle of your next training session and almost as if on que, that little voice pops up telling you to stop. You’re feeling exhausted, but you keep pushing on. Why? Because you know you’ve been in this position before and pushed through to the end. Even better, you know that you actually managed to beat your previous time while in the same exhausted state. That knowledge becomes your motivation. You push on determined to write down and even better time at the end of this training session. And you thought keeping track of your training sessions couldn’t help you continue running while in the pain. The Most Important Thing to Remember Is Be Patient! This tip right here is one of the simplest, but often most overlooked pieces of advice anyone could possibly be given. You should start off with proper expectations. Don’t begin your training with an idea that you’ll just be able to start running the way you want to overnight. The biggest problem for so many people is that they are way too impatient. Understand that is going to take some time to build up your aerobic endurance. You’re going to need time to build up your muscular strength in those legs. You have to be patient. Take baby steps. One step at a time. We’re aware that this sounds so basic, but it truly is one of those things that majority of people simply don’t think about. To help give you more of a realistic timeframe, we suggest that you try out this routine for about 6 weeks. For those of you just starting out, 3 days out of every week, get out there and work on the interval training that we mentioned a little earlier. During the rest of the week, pick another 3 days and start working on that resistance training. Make sure to take one full day of rest to allow your body time to recover. After all, your body doesn’t grow when working out. It grows when it’s in a state of repair and rest. Remember to remain patient as you progress, regardless of what your goals are, at the end of the day progress is what you are looking for. You may have your bad days and good days, but keep working hard. Running through the pain will become second nature. Eventually, you won’t even notice it. If you are looking to upgrade your running wardrobe, check out our friends from SOARK. The have been making wonderful running clothes since 1986.